Mary Klausner, the oldest daughter of Schmuel and Mindel (Sam and Minnie) Klausner, was born near Tetiev, Ukraine on December 12, 1896. She came to Cleveland in August 1910 at age 14, with her father Sam and brother Harry. Her two older brothers were already here. Mary would help around the house and look after six-year old Harry. We quote below from a memoir Mary dictated to her daughter Betty around 1940. To read the entire letter, click here. Mary went to school for about two years then went to work in a shop running a sewing machine and then attended night school. Before the year was over, Mindel decided the shop was not for Mary. She was needed at home, and the men were earning a good living. Mary was then the sewer for the family. She made dresses, night clothes, shirts and pants. I have no idea where she learned. She followed patterns and also combined them to get the effect she wanted. Isadore (Issie) Klotzman, age 16, appears in the 1910 census living at 2636 East 29th Street with his parents Samuel and Esther. It shows Issie's father Samuel, a peddler, arriving in 1903; the mother Esther and the three children in 1907. (see lines 7-11). Mary's letter tells of meeting Issie (Isadore) Klotzman through her friend Ida who was Issie’s younger sister. Issie and his family were Klausner "landsmen"; they were both born near Tetiev and their fathers probably prayed together in the same synagogue. Issie loved horses and obtained work making deliveries for a Kosher butcher, using a horse-drawn carriage. Soon he was promoted to working in the shop and he learned to be a butcher. After some years employed as a butcher, Issie opened his first butcher shop. As he was a member of the Tetiever shul, then located at East 40th and Woodland, we can assume that his first shop was located in the same neighborhood. Issie's first butcher shop, near Woodland Avenue. He is in the center, near the scale. All the signs are in Yiddish. The immigrants who had come to the Woodland area in the years 1880 - 1910, began moving east in the 1910's and by the early 20's the movement accelerated. Most Jews moved to northeast the Glenville neighborhood, others went southeast to the Kinsman-Mount Pleasant neighborhood. In the depression Issie lost his butcher shop and went to work for the Klausner Cooperage as a factory supervisor. He would work seven long days each week and take public transportation from his home to the factory on Grant Avenue. In 1938 he opened his second shop, Parkgate Meat Market, at East 105th Street and Parkgate in the heart of Glenville. It was less than a mile from the Tetiever shul on Linn Drive and less than a mile from his home. In 1953 Issie moved his store to 1839 South Taylor Road in Cleveland Heights, which was then becoming the heart of the Orthodox Jewish community. His son Fred built the new store. About ten years later Issie sold the store and retired. In 1925 Issie, Mary and their children moved to a small apartment building at 11209 Whitmore Avenue, near Lakeview Road in Glenville. This was not far from the planned new home of the Tetiever synagogue on Linn Drive. 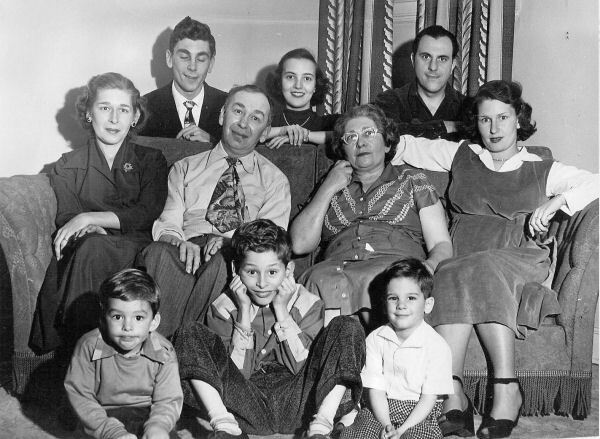 In the 1940s and early 1950s Jews left Cleveland's Glenville neighborhood for the "Heights": the inner-ring suburbs of Cleveland Heights, University Heights and Shaker Heights. In 1950 the family moved to a home at East Silsby and Halcyon in Beachwood. More on Glenville's rise and fall as as Jewish neighborhood. Betty (b 1920 -d 2001), graduated from John Hay High School having taken many commercial courses. After graduation she worked as a secretary at the A & H Klausner Company (her uncles' steel drum company). 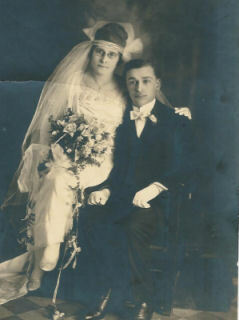 She married Sam Bernstein in September 1940. They had two children, Monte and Gary. Because of Betty these pages have a letter transmitting her mother Mary Klausner's memories. Ruth (b 1922 - d 1993), graduated from Glenville High School. During WW II she worked for Fisher Body helping to build B29 bombers. She was a "bucker" who would get inside the plane and work with a riveter on the outside. In November 1945 Ruth married Marv Yelsky. They had two children, Lanny and Marilyn (Blaustein). Fred (b 1927), graduated from Glenville High School and served in the Army in WW II. In June 1951, after his graduation from Cornell University, he married Judy Vision. They have three sons: Davis, Kerry and Bruce. More on Fred on the next page. Not included: Sam Bernstein who was taking the picture. For the complete letter about Mary Klausner Klotzman, click here. Issie had a Kosher butcher shop and he would be a life-long member of the Orthodox Tetiever congregation. In 1957, when the Tetiever shul on Linn Drive built a new synagogue on Warrensville Center Road in Cleveland Heights (it was the largest of the three congregations that would coalesce into Warrensville Center Synagogue), Issie made that transition. Later, five more small synagogues would join the new synagogue. The sons and grandsons of the men who at the turn of the century had formed shuls based on country of origin - Hungarians, Tetievers, etc - had become American Orthodox Jews. 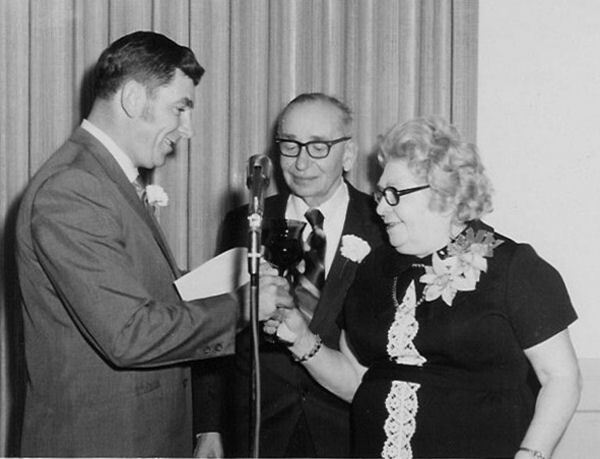 1969 - Issie and Mary Klotzman receive a toast from their son Fred. The occasion was Issie and Mary's 50th wedding anniversary. Issie Klotzman died in 1971, at the age of 77. Mary died in 1975 at the age of 79. They are buried in Ridge Road #2 cemetery, in the section the Tetiever Benevolent Society acquired more than 100 years ago. 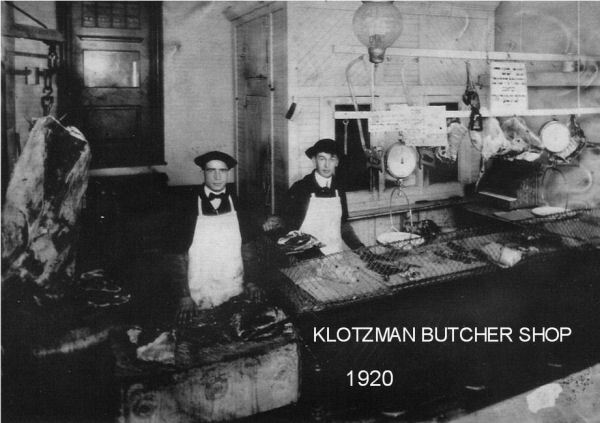 Continue to a page about Mary's son, Fred Klotzman.